*Disclaimer: We received free treats from Cloud Star in exchange for a review. All opinions, thoughts, etc. are my own or rather my dog's own. She is pretty excited about it. * It is no secret that I love my dog - after all, she pretty much takes up 50% of my instagram feed. It may be going to her head, she thinks she is kind of a big deal. Since our pup is a big part of our family , we make sure that she eats good food, spend lots of time outside, and has adequate napping surfaces - clearly, her life is hard. Over the years, she has developed a sensitive stomach, she had acute pancreatitis awhile ago and ever since, she has had to have special food (read: crazy expensive food) and it has taken some trial and error to find one she likes. We've gone through the same process with treats - previously, she liked treats but she wasn't as thrilled with as she was with say, an apple or brussel sprouts (her two favorite foods). 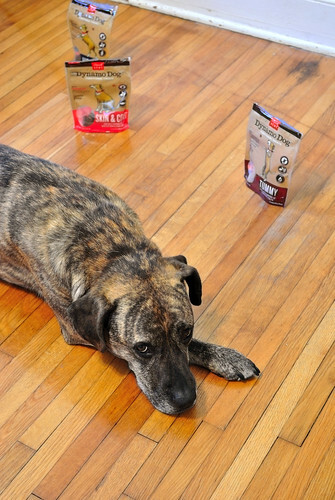 I say previously because now, she is ALL ABOUT these Dynamo Dog treats from Cloud Star. 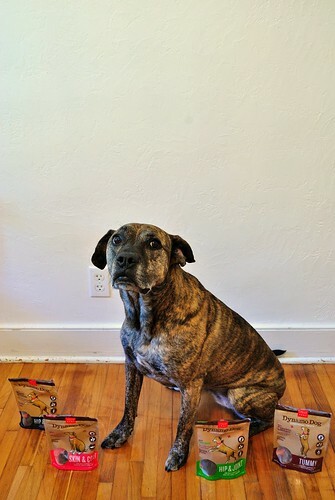 - Hip & Joint: These treats have added glucosamine HCL & chondroitin sulfate to help support healthy joint function which is super important as she is getting older (almost 8!). These come in bacon & cheese and chicken flavor. - Tummy: These treats have added probiotics to help with digestion and sensitive stomachs. These have really helped her stomach and she is obsessed with the pumpkin & ginger flavor. - Skin & Coat: These treats have added Vitamin E to keep their coats shiny and healthy and come in Salmon flavor. Her coat has been looking mighty shiny since using these! Bottom line? These treats are pretty great as far as dog treats go - they're not full of weird chemicals or ingredients (why should they have to eat that stuff if you wouldn't?! ), they seem to be super delicious, and best of all, they're functional treats! P.S. The pup says she would appreciate more PR pitches and review opportunities. Also, she thinks reviews are hard work. DIVA.